Effectively change your bottomline by changing your corporate culture! Changing corporate culture is not always an easy or pleasant task. However, our team of skilled professionals will assist with managing the day to day concerns in order to add more value and productivity to your organization. Create training modules to educate, nurture, and re-building lives affected by bullying. Effectively Change Church Culture by Enriching Members’ Lives! A gathering of churches in small towns for the purpose of community training to meet area needs. Need to customize training to meet a specific need in our church. We encourage you to maximize your potential. Join Dr. Jacquie this year for the premiere Success in the City Tour. The April 2018 Spring stop will be in the Loudoun County area, at the Leesburg Junction. The most impactful 2-hours of your life! 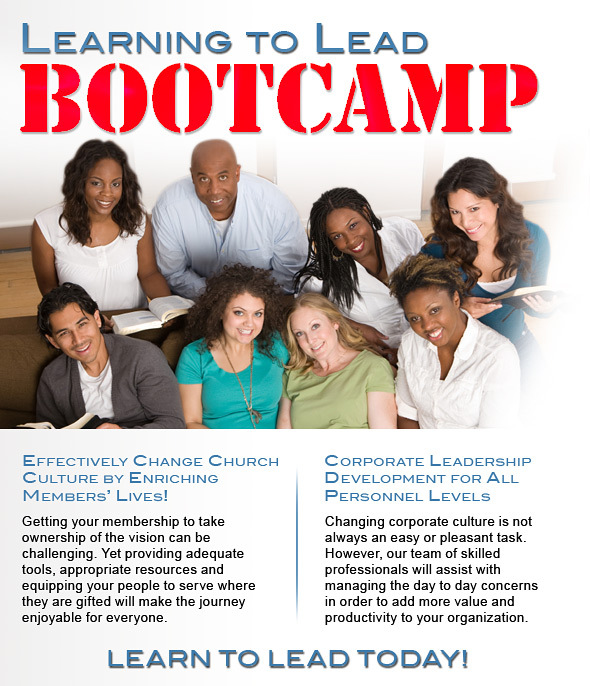 The Learn to Lead Bootcamp: Cost $50. You only need to attend the (1) 2-hour session. Contact her at http://jacquiehood.com/contact/ for details. Combined or individual sessions available. Register for the Learning to Lead Bootcamp securely online through PayPal or use the contact information posted below or the form to submit an email to Jacquie Hood Martin. If you have questions, comments or a praise report contact Jacquie Hood Martin Ministries today.